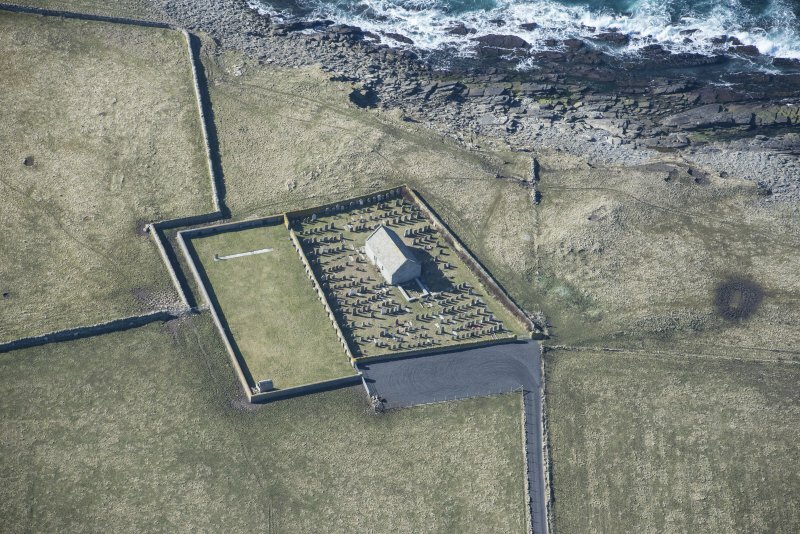 St Boniface's Church, Papay. Cross-slab. 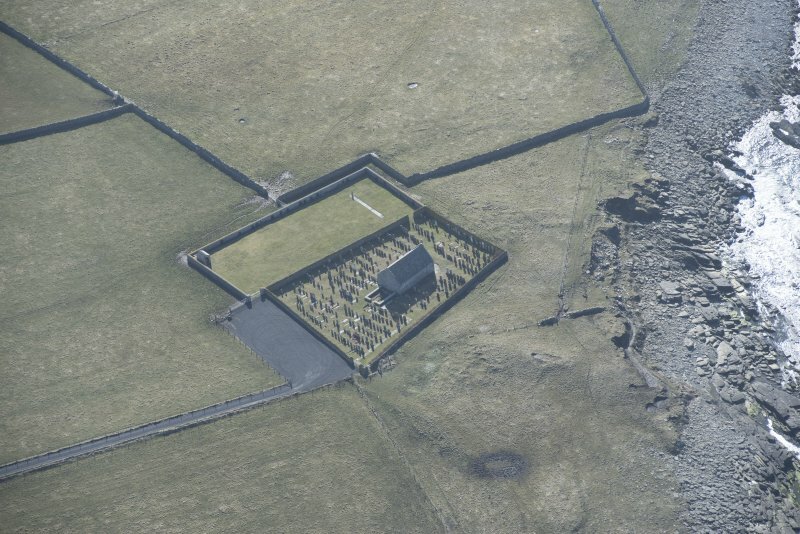 St Boniface's Church, Papay. Hogback stone. 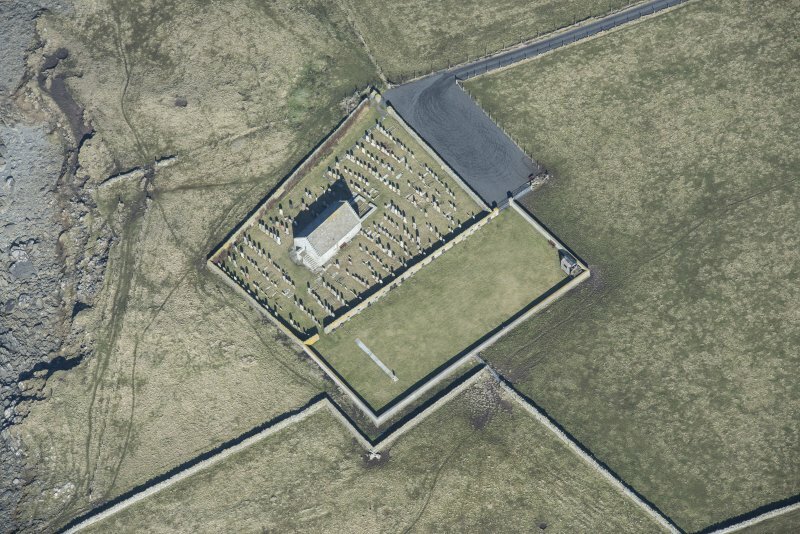 Oblique aerial view centred on St Boniface's Church, Papa Westray, taken from the SE. 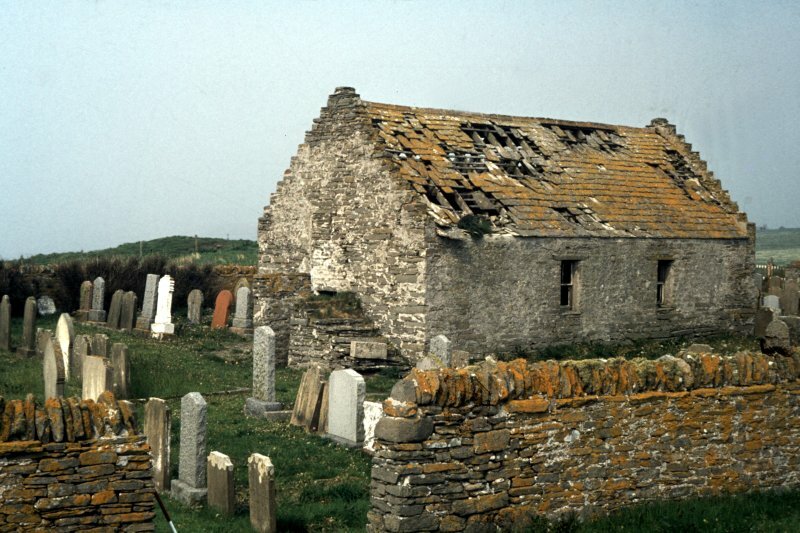 The old parish church of Papay stands above a rocky shore in the now sparsely inhabited NW corner of the island. 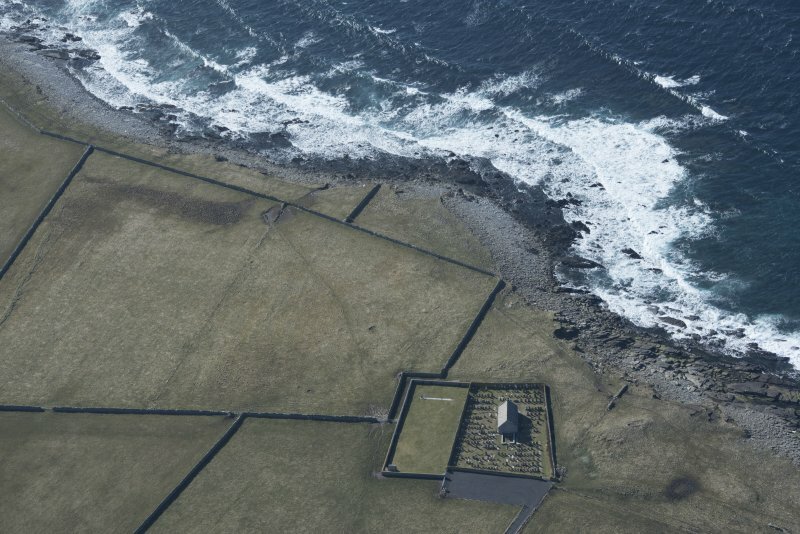 It is associated with extensive settlement, remains of the Iron Age and Pictish period (HY45SE 26), with two discoveries of Early Christian cross-slabs, and a Norse hogbacked monument; added to the place-name evidence, they indicate that the whole complex was an important early ecclesiastical centre. The church, still in use in 1920 but abandoned by 1930, is essentially a twelfth- century church, which was extended westwards in 1700. 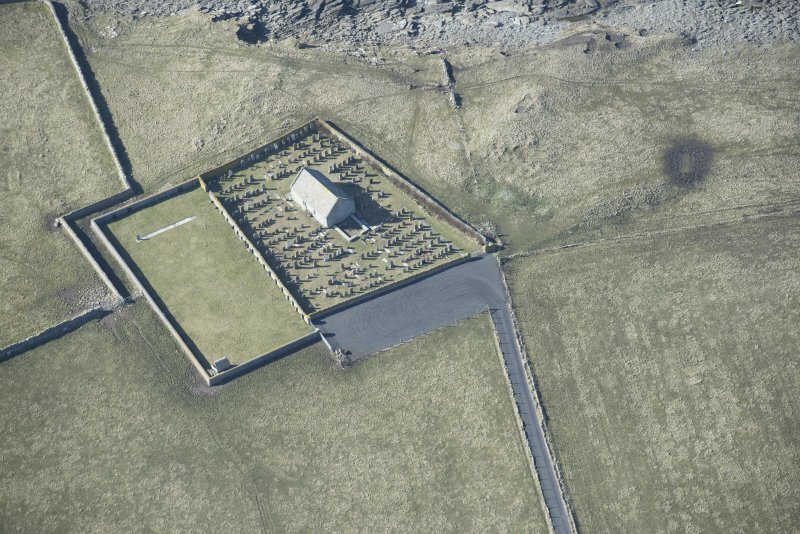 The site of its chancel is occupied by a family burial-place. The building is still entire, but there are holes in the slab-covered roof, and the internal furnishings and some of the structural timbers are succumbing to decay. The hogbacked gravestone lies immediately E of the family tomb, but only its top now protrudes from the grass. 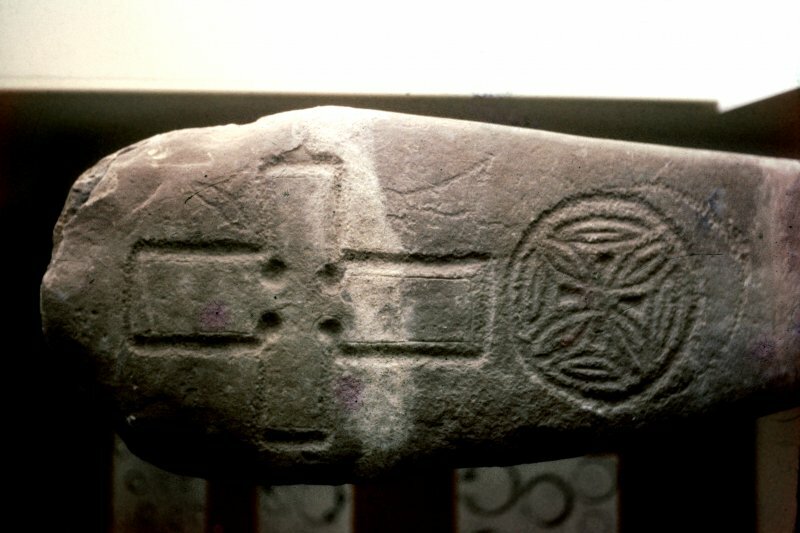 In 1920, when for the first time burials were made on the N side of the church, a slab was found at a depth of about 1m; a portion was left in the ground, but the part now in the Royal Museum of Scotland (RMS, IB 200) has an encircled cross pattee with a small incised cross, of unusual design, above it. In 1966, a second slab, now in Tankerness House Museum, Kirkwall, was found during grave-digging near the NE corner of the church. W Kirkness 1921; A B Scott 1922; RCAHMS 1946; J T Lang 1974, RCAHMS 1983, visited June 1982. There is a long history of activity on this site from iron-age times onwards into the 20th century. Initially there was a domestic settlement established around the 6th century BC and including a massive roundhouse, and this settlement appears to have continued through the first thousand years AD. Excavation in 1990 caught the last vestiges of the roundhouse before coastal erosion claimed it, but the site had been known, and indeed visible in the cliff-section, for more than a century. 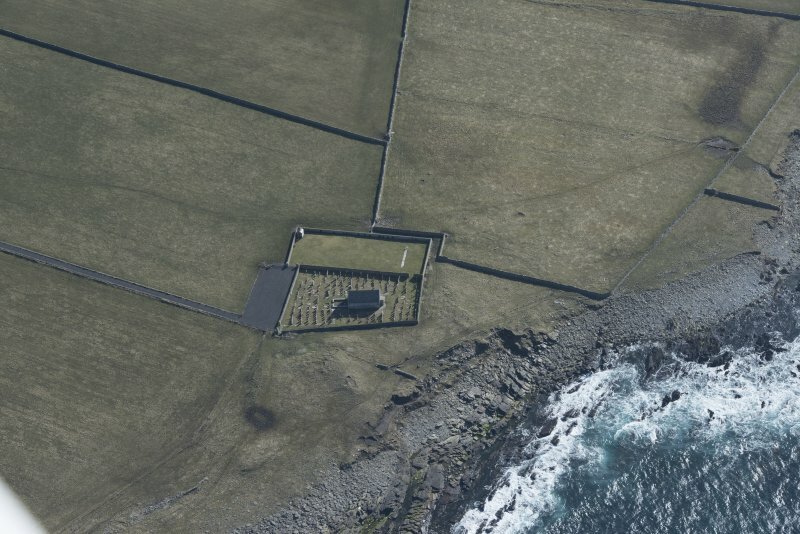 The settlement was clearly of some importance, probably the major farm in the island in its time, and it was the obvious place to choose when a Christian monastery was established in the 8th century. Folk memory of this monastic site lingers on in the name Munkerhoose, monks' house. Nothing structural has been found of this early monastery, but the presence of two cross-slabs and part of a stone-built shrine datable to the 8th century are tangible evidence of its existence. There is also documentary and place-name evidence, especially the name coined for the island by the incoming Vikings, for papae was their term for priests and monks. The early church appears to have continued in use throughout Norse times. 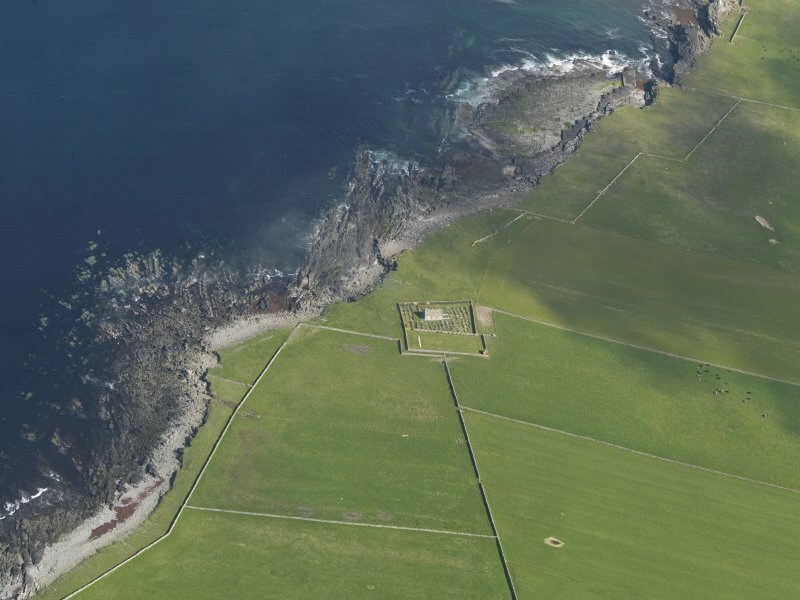 In the 12th century, the island was part of a large estate based on North Ronaldsay, and a new church was built, which was dedicated to St Boniface and is the core of the church that survives today. It consisted of a small nave and chancel, but the former was extended westwards in 1700 to accommodate an internal gallery served by an external stair, and the chancel was demolished at some unknown date. Its position was used for the burial enclosure of the Traill family, who lived at Holland. 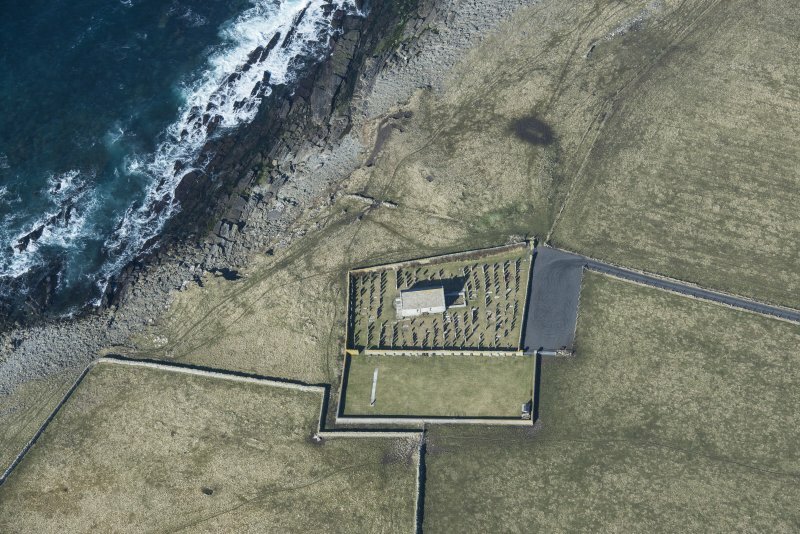 The importance of the church here in Norse times is reflected by the fact recorded in Orkneyinga Saga that an earl was buried in Papa Westray in the mid 11th century (chap.30). A tombstone of Norse type is still to be seen in the churchyard, but its style dates it to the following century. This is a late vers ion of the hogback, and it lies in an east-west direction, accompanied by a small upright headstone. It is carved from a block of red sandstone, 1.55m long, with a deep groove running along its flat ridge and three rows of tegulae (rooftiles) carved along each side. It is one of the few examples in Scotland of a hogback which appears still to be in its original position. 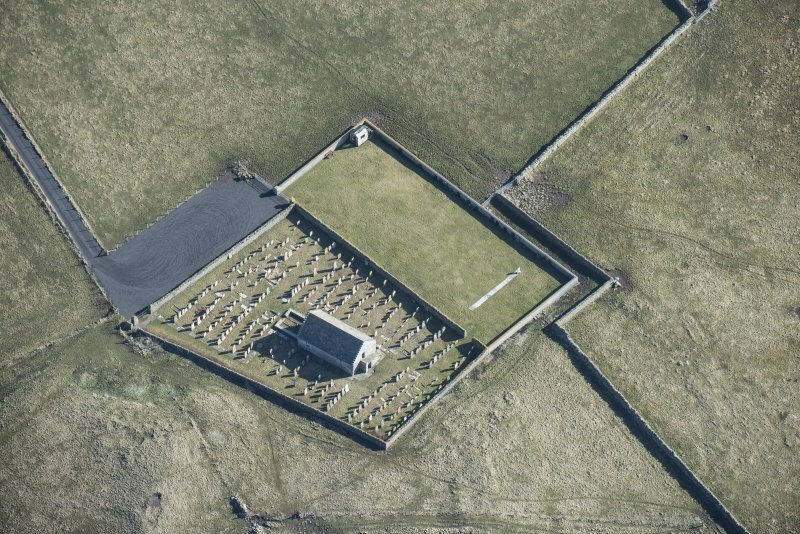 HY 4881 5269 - The old parish church of Papa Westray (HS Index 1484) constructed in the 12th C, was extended in the 18th C and remained in use until the 1920's. Following a period of disuse, during which the building began to fall into decay, it was renovated and re-opened in 1993 as a place of worship. Two Pictish cross slabs and a fragment of a reliquary shrine have been recovered from the graveyard and a Norse hog-backed tomb stone (HS Index 1478) remains in situ. The graveyard has been extended in recent times. The church has been built over extensive remains of earlier settlement, some of which has been revealed in the nearby coastal section (see HY45SE 26). attending Mass at the church in the porp or village (i.e. have been associated with the arrival of Bishop John at Knarston. NOMENCLATURE - St Boniface is the dedication of the church. separate discoveries of incised cross-slabs. state of collapse, the whole very damp. 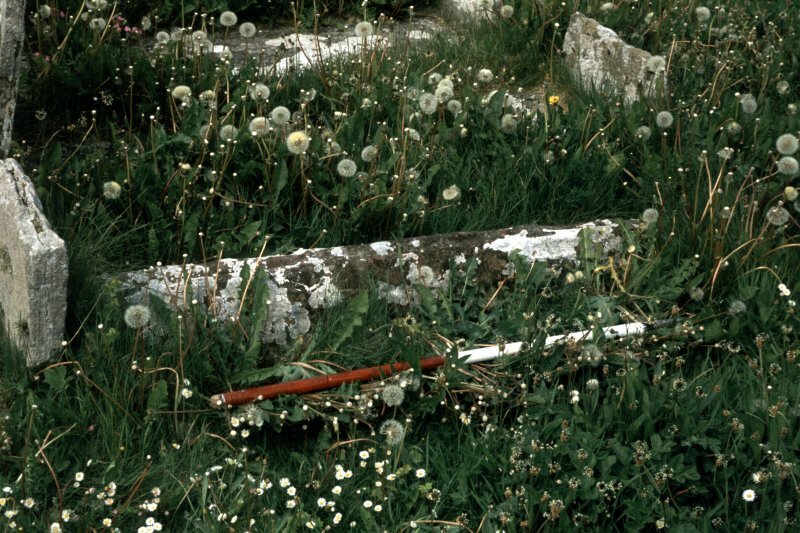 RGL Jun 82.
cross pate with a more badly-incised square-armed cross above it. occupation well into the early mediaeval period. stone structures in the area W of the churchyard.